We supply all types of conveyor belts for industries such as agricultural, automotive, canning, computer, electronics, food processing, aerospace, chemical, bottling and print finishing benefit from such handling equipment. Many belts fall into this category, and there is a belt for every need. Distribution Centers use fast-moving high grip belts to accelerate packages, and low friction belts to accumulate or divert packages. 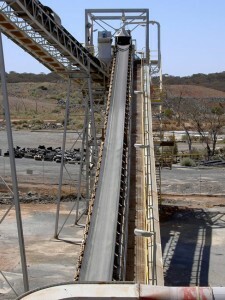 Long conveyors sometimes get over-tensioned (causing fasteners to pull out of the belt) or get knocked out of square (causing tracking problems). Nonwoven belts hold fasteners better and are more forgiving when knocked off track. Cardboard processing is very abrasive and has traditionally used durable nonwoven, interwoven and plied rubber belts. Newer machinery has benefited from thinner belts that can go around small pulleys at fast speeds. These cross-rigid monofilament belts are part of the Plied Thermoplastic group. Thinner belts use less energy and smaller motors to run. But the thinner a belt gets, the more it needs monofilament to keep it laying flat. Farming, natural resource processing, and recycling use sturdier belts typical of nonwoven, interwoven, plied rubber, and heavy duty rubber. Airport luggage handling works best with nonwoven belts. Cut resistance is available in several belt types, such as thermoplastic and nonwoven belts with hard urethane covers. These are belts with various types of surfaces to either grip product firmly or collect it in pockets across the belt surface. Most offer a roughtop grip impression. Plied Rubber also includes diamondtop, steepgrade and tylerwire grip impressions. Nonwoven grip belts include roughtop and groovetop surfaces. Plied thermoplastics have those two plus sawtooth, lattice top, and other useful grip surfaces. Modular belting depends on “rubber” inserts that are good at grabbing flat surfaces. All styles of belt are available with vertical cleats that collect and convey product up inclines. Interwoven and heavy duty rubber have chevron and crescent surfaces that are basically mini-cleats. Similarly, thermoplastic belts offer minicleat and Z-cleat. Many times these surfaces, and a few others, are used to convey product that would be hard to discharge from a flat belt — like Wet or sticky flat product. Plastic injection molding uses cleated belts and minicleat impressions to convey parts up from the bottom of the molding machine. Box and package handling relies mainly on roughtop belting, with diamontop and steepgrade used on steeper inclines. These belts are mostly plied rubber, plied thermoplastic, and plastic modular. Some include antimicrobial agents. Many are better classified as machine belts, since they do more processing than conveying. Processed Foods often require oil-resistant thermoplastic and plastic modular belts that can be washed down without absorbing liquid. Dough Processing sometimes requires oil-resistance and often requires an impressioned belt surface that can manipulate the dough and release it cleanly. Dough transfer lines need smooth non-stick belts. Packaging of Personal and Health Care products typically use food-grade belts in areas such as compounding, weighing, conveying bottles, lids & pumps, cartoning, and on robot pick & place lines. Typically specialized applications involving extreme chemical, mechanical, cutting or abrasive conditions. Strapping machines are subject to considerable abrasion. Both Signode and Ovalstrapping use high duty belts, though one requires a high grip surface while the other needs smooth. Metal Stamping operations use a lot of these belts. And so do many cardboard processing and paperhandling applications (both very abrasive). Automated Die-Cutting presses require extremely flat belting with a hard urethane or nylon cover. The best belts will guarantee the number of hits you make. Plastic Modular belts are used in a wide range of industries. Traditionally they have been used in food processing where operators use knives on the belt, rinse vegetables, perform end of day washdown, and where USDA insists on a belt that will not absorb fluid or harbor bacteria. Though they create more noise than a flat belt and are more expensive, conveyor manufacturers in all industries are increasing their use of these belts because plastic modular is durable and easy to maintain. One caveat — stay with a common pitch. Intralox and Rex make special pitches that are not compatible with price competitive brands. Modular belts offer some additional advantages over flat belting. High temperature and hydrolysis resistant belts are available for long-term use at 392°F and short-term up to 464°. Tight Radius belting allows extremely tight turns and requires 30 percent less space than flat belting. It is ideally suited for spiral conveyors, including freezers as cold as -40°. Its open construction provides cooling air to circulate without marking off on the product. Imaginative belts fall into this category. High Temperature, Screen belting, Cotton, Wool Felt, Extruded belting to name a few. Habasit Extraline processing belts, in widths of up to 4 meters, are used in demanding applications like textile printing, nonwoven web-laying machines, deaeration of composite wood board, panel board production, and materials-handling industries. Extraline textile print blankets offer perfect accuracy and 1200 CFM Dryer Blankets offer complete non-marking drying. Extraline prepress belts provide high pressure and abrasion resistance as well as the excellent compression distribution that is necessary in composite board manufacturing. Extraline Deaeration Belts and Forming Belts allow additional quality and increased speed of composite board lines. Dense nonwowen belts of both Nomex and Kevlar are available for gentle handling of soft hot product. Screen belts in food grade and high temp/ hydrolysis resistant versions are available for applications from fish to fabric. Solid Woven Cotton is still made for those special applications like Baking, Airslide, Corrugators and Paper Sheeting. Truly endless Wool Felt belts are consistently chosen for croissant and long bread production. Extruded Belting constructions span the range from elastic to stable. Elasticity is required when multiple belts are used on a common shaft. Round belts excel when belts must change planes of direction. High Modulus extruded flat belting is available in both polyester and polyurethane up to 125 mil thick. High Impact Robotic Gripping benefits from a high modulus belt that can slip into engagement.